Oh how Charlie will be missed! 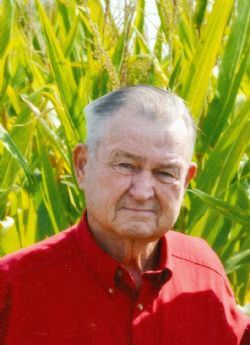 A man of true character, the epitome of the Nebraska Farmer. Love for God, Family & Neighbor. I am grateful to have been able to spend time with him this past year. May he Rest In Peace. Praying for you & your family Bev. I have enjoyed you all this past year. I am so very sorry that I am unable to make it to the memorial service, due to the poor road conditions in my area right now. I am & will continue to hold you all up in prayer. Blessings to You All with the Father’s comfort & peace. I hadn't seen this face in 40 years, but I instantly recognized the photo. Charlie and his wife, Bev, were two of the most gracious and decent people I ever met growing up. Neither would remember me, but I visited them a couple times. They had a farm they work pretty much alone; a massive amount of work. But Charlie still found time for his community. I have particularly vivid and fond memories of Charlie in the Fremont Community Players. They mounted a production of "Harvey" (the six-foot invisible rabbit), and he took the Elwood P. Dowd role that Jimmy Stewart played in the movie. He didn't do a Stewart imitation -- he crafted a unique bright-eyed amiable eccentric character with a slightly vacant drawl and a warm heart. He was hysterical; naturally funny. Sends me into fits of warm laughter every time think back to those days. My sympathy to Bev and the three girls and their families. Charlie was a kindhearted, caring, and loving man. His family was very important to him. Also, his relationship with friends and neighbors who are also going to miss him. You all have so many good memories of him in your heart. You'll never forget him. God give you strength and peace in the days ahead. Bev and girls - I'm so sorry to hear of Charlie's passing. He was a kind, funny man. May those memories keep you going throughout the days ahead. Charlie was a great guy. So sorry for you loss. I'm sure he is finding some fellow farmers in heaven to share coffee with every morning. God comfort you all. Bev, So sorry to hear about your loss. You are in my prayers. I'm sorry I can't be at the visitation tonight, but will probably see you some time at the "Office". Take care! Charlie was a kind, gentle man...always a pleasant expression on his face....a good sense of humor. Our sympathies and prayers are with you as you miss him. "Precious in the sight of the Lord is the death of His saints" Psalm 116:15 May you find peace knowing you will see him again in eternity. Hi Bev, Just thinking of you at this time in your life. Sympathies to you and your family. Charlie was always a great guy.Take care and enjoy your life with your family.